Brown Recluse Spiders, sometimes called “fiddleback spiders”, are so named because of a dark fiddle marking on top of the head. Even young spiders have this mark. Habits: Brown Recluse spiders are primarily structural pests, living inside and around buildings. These spiders move from attics to wall voids into the living areas of homes starting in late April and May. This movement coincides with their breeding season. Young spiderlings can be found moving about in June. Often homeowners are not aware of these infestations because Brown Recluses are active mostly at night. They over-winter outside in unheated buildings under the bark of trees near houses as well as inside homes. Brown Recluse are more active April through October, but may be seen crawling any month of the year. Ordinary retail aerosols and liquid sprays do not effectively control this pest. Many insecticides are repellent and do not affect spiders. as they do insects. Brown Recluse spider control requires help from professional pest control firms. An entomologist or qualified professional should make a detailed inspection and draw up a service plan for treatment. 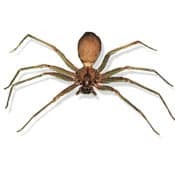 Habitat: Brown Recluse live in ceiling voids, attics, wall voids, under tack strip carpets, crawl spaces, cardboard boxes, drawer wells, closets, storage rooms, base shoe, doors, windows and ceiling trim, and sub-cabinet voids. They also may be found behind wall hangings, under wood shake shingles, roofing, guttering and many other places too numerous to mention. Prevention: Homeowners can reduce harborage areas by removing all empty cardboard boxes and sealing all storage boxes with masking tape. Control of this venomous spider requires extensive preparation by the homeowner and extremely thorough structural treatment of cracks and crevices, voids, room perimeters, garages, attics, basements, crawl spaces, exterior treatments and treatment of out buildings. Such treatment may require several hours to perform, using techniques developed by Parker Pest Control Inc.specifically for this pest. If you suspect a Brown Recluse infestation, Parker Pest Control Inc.’s qualified professionals can make the proper identification, examine the structure, place spider traps and monitor any spider population in your home or office and make recommendations for treatment. More than fifty percent of the homes in Oklahoma have Brown Recluse infestations, to one degree or another. Parker’s quarterly service and monitoring program is scheduled after the initial services to make certain that the spider population is completely eliminated. Bites from Brown Recluses are frequent enough to be a health hazard!